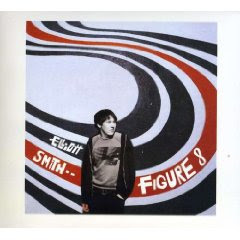 Elliott Smith becomes sunnier and less lo-fi with this album. This is, however, compensated by just brilliant song writing. The move to a larger label made him different but by no means worse. This is one of those albums which take a while to sink in but when it does it becomes very hard to let go. All the tracks have little hooks that just make you cherish the music. These hooks are readily apparent in songs like Pretty Mary Kay and Everything Means Nothing To Me, one with a strange modulation in the chorus and the other kicking in after a long repetition of the title. These little things make you listen to the album in joyous expectation of certain moments which always pay back. Great stuff. The wall Smith stands in front of in Autumn de Wilde's photograph on the cover of the album exists in Los Angeles, and since his death it has become a memorial to him. It is covered with graffiti and written messages containing lyrics and personal messages to Smith. It is located at 4334 W. Sunset Boulevard, which is a store by the name of: "Solutions" Audio-Video Repair, just south of the intersection of Sunset Boulevard and Fountain Avenue. In 2007, the painting was returned to its original state after being vandalized. there are so many moments of pure sonic joy.